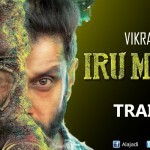 Vikram’s much-awaited “Iru Mugan” hits the screens on Thursday, Sept. 8. The movie has been written and directed by Anand Shankar of “Arima Nambi” fame. Vikram has paired up with Nayanthara and Nithya Menen in the film. This film is releasing simultaneously in both Tamil and Telugu language. Coming to plot of the film, Vikram plays dual role in this movie. One role is of an Ex-cop Akilan Anand and another is Love. Akilan gets an assignment as Indian Embassy was blasted by some unknown criminals. He gets assisted from Nithya Menen who is also an undercover Raw agent. Nayantara comes as Vikram’s wife in flashback portions. She gets killed by Love. Once again, Vikram faces task of locking horns with Love and this time what he does to payback for his wife’s death forms the rest of the story. A highly predictable story line with beaten to death screenplay and no engaging narration is what the movie is all about. The director tried something new but at the end there is no proper execution of the film. This movie may not impress family audience nor youngsters. This movie would just be another ’10 Endrathukulla’ or ‘Kandasamy’ for Vikram. His hardwork has been in vain once again. ‘Halena’ song is good. Cinematography is exemplary. Nothing else to brag about. Vikram: Vikram as always gives his best. He delivers his performance top-notch as Ex-cop Akilan Anand and Negative character Love. He carries the burden of the entire movie on his shoulders. He scores in fight sequences too. Nayantara: She is gorgeous as Halena and that’s it. She doesn’t get much screen space nor scope. Nitya Menon: She has paired with Vikram and the chemistry has been perfect. Nithya Menen as Raw agent has done justice to her role. Nassar, Thambi Ramaiah, Karunakaran have done justice to their roles as supporting cast. Thambi Ramaiah could have done better with comedy portions. RD Rajasekar’s cinematography was very good for this film it helps a lot. He has kept everything simple and some eagle view shots for chasing sequences has elevated the movie to whole new level. The colors are also vibrant and attractive. Bhuvan Srinivasan could have done better job with editing. Music by Harris Jayaraj was ok he just grab the attention in Halena song only. Production values are quite high and the makers have done it extensively.